The Australian Library Journal says: “Organised into chapters based on 16 themes, it is easy for the reader to find a story and associated activity to bring storytimes to life. Although written for librarians, the chosen themes follow topics common to many units of work in early education, and the stories and activities could easily be adapted by teachers to enhance either an integrated or trans-disciplinary unit of work.” Read the full review. 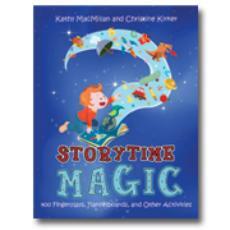 Featuring full-size flannelboard and magnetboard patterns and craft templates to go with the book Storytime Magic.